When David Cameron stood up in the House of Commons this week to respond to the refugee crisis he engaged in the language of British exceptionalism so familiar on major national political occasions. Britain, the Prime Minister, said, was “a country of extraordinary compassion, always standing up for our values and helping those in need”. Mr Cameron couldn’t also help pointing out that in another respect Britain was clearly superior to other nations. No other European country, he said, had come close to matching the amount of aid offered by the UK to refugee camps in countries neighbouring Syria. In extolling the virtues of Britain the Prime Minister was continuing the tradition expected of the incumbents of Downing Street. From John Major’s insistence that Britain was the best country in the world, to Gordon Brown’s fondness for referring to the British genius, no-one has been left in any doubt about the strengths and virtues of Great Britain and its people. The importance of this message was made clear during the current Labour leadership election when Liz Kendall seized on an apparent gaffe from Andy Burnham when Mr Burnham said “the party should come first. “ Ms Kendall reminded him sternly that country should always come before party. None of this, to me, is particularly troubling. On the whole telling a community of people they are good at something would seem to be a useful means of boosting self-confidence and pride. In addition David Cameron genuinely deserves credit for maintaining the UK aid budget amid clear scepticism from many within his own party. But what is hard to take in a UK context is the casual, unremarked, blatant hypocrisy of all this rhetoric. Because every politician and commentator who gets misty-eyed at the achievements of Britannia, also seems to reserve particular venom for those terrible people called “nationalists”, particularly nationalists of the Scottish variety. This spurious distinction was made time and time again during the independence referendum by those in favour of the Union. Following on from this line-to-take, some commentators and politicians are now engaged in a seemingly relentless search to expose any transgression from SNP politicians who might dare to even hint at any political difference between Scotland and the rest of the UK. The vigilance level reached a new peak this week in a column for a right-wing website by David Torrance (a commentator who I personally like and usually find worth reading) based on remarks by the First Minister during a summit on the refugee situation last Friday. 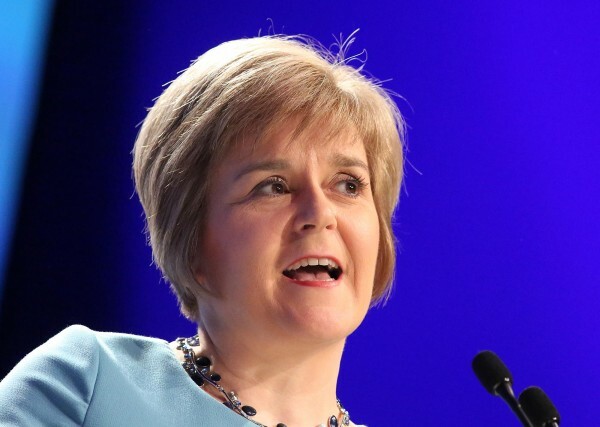 In her short speech the FM referred to a welcoming and tolerant tradition but went out of her way to explicitly state that this was not unique to Scotland. She praised Britain and specifically cited the London-born Sir Nicholas Winton who rescued Jewish and other children from the Nazis in the 1930s. Her remarks by any measure were less “nationalist” than those of the Prime Minister. They are part of a tradition in mainstream SNP thinking that rejects the idea that we in Scotland are better than anyone else. It was the current Scottish Government, of course, that binned the dreadful Jack McConnell-era slogan: “the best wee country in the world”. But such is the prevailing mood among serious people that David rushed out a heroic discourse analysis to reveal the true nature of the First Minister’s intentions. Somehow Nicola’s inclusive words were really, in some way not quite explained, a further example of the SNP’s insidious attempt to bring the Union into every debate and were “framed in Nationalist terms”. In fact, on the issues of immigration and asylum there is an obvious, manifest difference between the tone of political debate at Holyrood and Westminster. That’s not making a point, nationalist or otherwise. It’s just a fact. More generally I am grateful that the overwhelming majority of people in Scotland rejected the divisive policies and rhetoric of the Conservative Party at the last election. That doesn’t make voters here, or Scotland as a whole, better. But it does mean we have made a different political choice. Surely commentators would do better to try to understand the reasons behind that choice, rather than trotting out the usual lazy preconceptions that characterise far too much contemporary political commentary in Scotland. David Torrance: the ‘Max Headroom’ of Scottish politics is a self regarding charlatan. Any opinion of his is not worth considering or worrying about. It’s all part of the concerted attack on Scotland as an entity both politically and culturally by craven toadies like this commentariat cipher. I fully agree. Torrance, at the 5 Million Questions session with Nicola Sturgeon, thought he’d made a killer point when saying that of course with Independence the Barnett Formula would go. My contempt for his shallowness knows no bounds. Well of course with independence the Barnett Formula would go. That’s because the Barnett Formula is all about balancing revenues and expenditures within a united UK. If Scotland becomes independent then the Barnett Formula is no longer relevant. A well dressed peice.I particularly like the quote patriotism rather than nationalism. So true.. The uk press and state broadcaster mock all other countries display of patriotism, include in this list Scotland. It’s in their uk DNA, others don’t have a Nelson, Wellington, Churchill or Farrah. An air of staggering supremacy and blindness to the achievements of others. Incidentally Wellington was Irish, Churchill half American and Farrah is Somali! No other world monarch is as important, dedicated, wise or all round decent as Liz, probe a bit deeper and ask yourself what has she ever done, achieved or supported that has not be done by a lackie on her behalf? But, tomorrow she will be portrayed as heroine on par with history’s greats. What has any modern day monarch done apart from leach? So tomorrow we will see a celebration for someone given everything and more in return for doing nothing. This will be a spun into a british nationalist message exclaiming we have the best head of state in the world and this in turn makes us great. There is only one way bbc and uk media will portray their Scottish problem, british nationalism good, Scottish nationalism bad. After the past few days the depths that british nationalism will stoop to have yet to bottom out! I’m a republican, but I think it’s a little unfair to pour scorn on the Queen as a person. She has been brought up (or brain-washed) to think, act and believe as a monarch. We are also to blame for allowing the monarchy to prosper. Well worth a read, there are some classic quotes in there. – also paying attention to Ray Bell’s comment, which links to Orwell’s late-in-life epiphany that “In this country I don’t think it is enough realized—I myself had no idea of it until a few years ago—that Scotland has a case against England”. Thanks for posting this link Blether, it’s an absolute goldmine! I just finished reading through the other comments on Michael Greenwell’s article. The nation-state is the fundamental way that world power has been organised since the Treaty of Westphalia. I believe the British habit of pooh-poohing the idea of the nation has a lot to do with diminishing the pain of Britain’s reduced status since WWII. Try going to Asia and telling them that belief in your nation is a bad thing. Ho ho ho! It’s almost heart-warming to see the enjoyment that the revival of Jingoism under American auspices affords British – or Bringlish, as I’m starting to think of them – Prime Minsters. In 1878. Always nice to see humility in the biggest guy in the room. There was an article in the Guardian the other day by John Harris pointing out that Britain’s compassion is something of a myth. The trouble with myths is when they become accepted as reality and are used as a screen to hide behind, as Cameron is doing v-a-v the refugee crisis.